History is being made this week with President Obama’s visit to Hiroshima. He is the only sitting U.S. president to make the trip to the site of the first atomic bombing on Japan during World War II. Last week President Obama put forth his strategy for defeating the terrorist army ISIL. Feeding the starving civilians in both Iraq and Syria is a vital component of this plan. President Obama, as part of his Middle East tour, visited Jordan today to meet with King Abdullah II. Jordan is home to 460,000 refugees from the war in Syria. The UN World Food Programme (WFP) says it’s “strained by limited resources” trying to feed a refugee population that grows by the day. During March WFP plans to feed 142,000 refugees at the Al Za’atri camp. As the numbers of refugees increase, food distributions are becoming more crowded and difficult. New camp sites are being explored. WFP faces a funding shortage of US $156 million dollars for its refugee relief operation and its mission inside Syria. Resources are also stretched thin because of other ongoing hunger emergencies in war-torn Mali, South Sudan, Afghanistan, Yemen and other nations. The UN food agency is voluntarily funded. 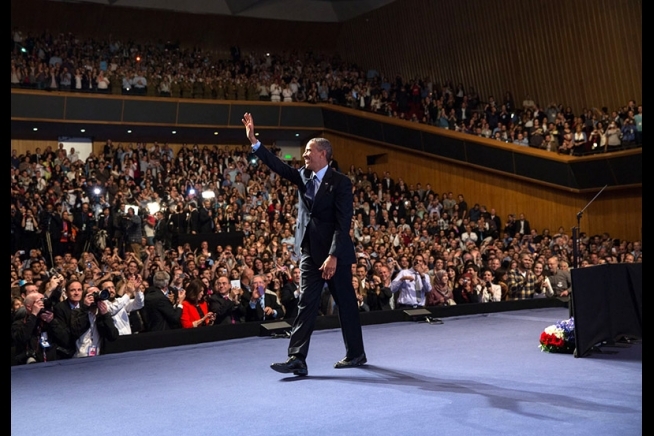 President Obama said today the US will provide $ 200 million in additional humanitarian aid. As the conflict continues the humanitarian needs will grow. The US budget for international food aid though is at risk of cuts through the Sequester. 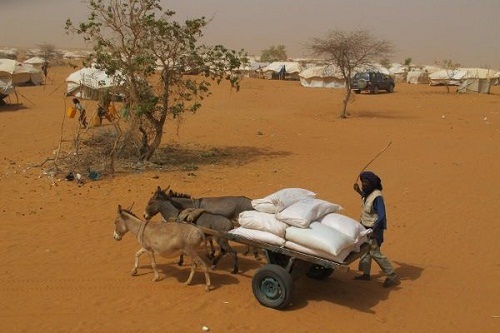 WFP has set up a relief fund for the Syria crisis. As President Obama delivers the State of the Union address he will need to build bipartisan support for ending the great threat to peace and economic stability: hunger. Whether in the U.S. or far away in South Sudan or Syria, hunger cannot be ignored, or placed on the back burner as an issue for others to deal with. The President needs to show powerful leadership and the State of the Union offers this opportunity. Hunger is striking over 50 million people within the United States alone, of whom about 17 million are children. Supporting America’s system of food banks is crucial to keeping a safety net for those struggling. The food banks can then help individuals stay afloat and escape poverty through the local solutions they utilize. “We hear heartbreaking stories every day from people who come to the food pantries and soup kitchens served by the Feeding America network. Our food bank in Orlando recently told us a story about an elderly woman who walked nearly a mile to take a public bus to a food pantry and fainted while standing in line; a pantry volunteer gave the woman a ride to her home, which had little furniture and empty cupboards. It’s one of many stories our food banks hear on a daily basis,” says Aiken. Worldwide, hunger is afflicting over 870 million people. The crisis in Syria has rapidly increased the ranks of the hungry in the Middle East. The UN World Food Programme is feeding about 2.5 million people inside Syria and is expecting to feed another 750,000 who have fled to neighboring countries. The WFP’s biggest supporter is the U.S. Food for Peace program. Congress is not putting much support toward this initiative, though, and in fact there are some plans to reduce the funding. This would have a huge impact on the ability to respond to humanitarian emergencies such as Syria. If hunger thrives in the Middle East we can hardly expect peace and stability to emerge in that region. In Mali, where the government is fighting off Islamic extremists, it is food aid such as the McGovern-Dole school meals program that is helping keep children healthy in a time of crisis. Catholic Relief Services is feeding tens of thousands of children there because of this McGovern-Dole grant. We should not reduce funding for these programs that fight hunger and help promote peace. Afghanistan is another country where hunger reigns and peace remains elusive. Children are stunted from birth because of malnutrition leaving little hope for the future of the country. South Sudan is trying to build peace with its northern neighbor Sudan. It’s also trying to build peace within, after years of tribal conflict in Jonglei and other states. At the same time South Sudan is desperately trying to save its own children from starvation. The UN World Food Programme says that “nearly one-third of children under 5 are stunted, 23 percent are wasted, and 28 percent are underweight” in the country. The charity Save the Children has nutrition programs in South Sudan where severely malnourished children are brought to receive a special peanut paste called Plumpy’nut. This is a special food that can rescue children from death or lifelong physical and mental damage. Save the Children has a crisis fund to help South Sudan. These are the types of heroic food plans that save lives and form the foundation for peace. The President needs to rally the Congress and the country to end this hunger menace at home and abroad. 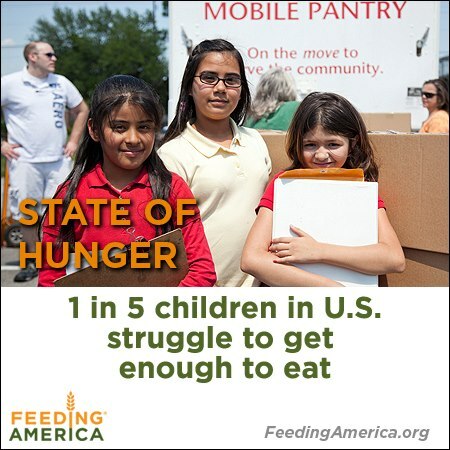 Article first published as Hunger Critical Issue for State of the Union on Blogcritics. With hunger emergencies ongoing in the Sahel region of Africa, Sudan, Yemen, Afghanistan and other countries, President Barack Obama faces one of his most daunting foreign policy challenges. The President will be making a speech about the global hunger crisis this Friday, May 18th, at the Symposium on Global Agriculture and Food Security in Washington D.C. The Sahel though is not the only area in crisis. East Africa is still recovering from last year’s drought and famine. In Sudan, as conflict escalates so does hunger. Farmers have been forced away from their land. Drought also has hit, leveling another blow at food production. As peace efforts go forward by the U.S. and allies, so too must humanitarian aid to the displaced. There must be a special effort at food for malnourished children under five years of age, and also feeding programs for school age children. In Afghanistan, hunger and malnutrition have severely damaged hopes for peace and development within the country. Low funding for the UN World Food Programme (WFP) has limited its ability to carry out hunger relief missions. The UN agency is warning that funding shortages will mean more cuts to programs helping the hungry. Even school feeding programs of high energy biscuits and take-home rations will face cuts again as they did last year unless support comes from the international community. Yemen, a country high on the U.S. national security priorities, is deeply mired in hunger and malnutrition. The World Food Programme says that 22 percent of the population suffers from severe hunger. A report from the UN says, there are almost one million children under the age of five in Yemen who are estimated to suffer from acute malnutrition, with 267,000 children at risk of dying without food aid. Children who suffer from malnutrition in the first years of life suffer lasting physical and mental damage. The key is to intervene quickly. About 60 percent of Yemen’s children suffer from stunting. Child malnutrition in parts of Yemen rivals that of famine-ravaged Somalia. The United Nations says that the humanitarian response plan in Yemen remains $265 million dollars underfunded. The challenge facing President Obama, as was the case with some of his predecessors, is to rally support for fighting global hunger, an issue often off the radar of politicians and media. President Harry Truman was able to do so after World War II when hunger threatened the recovery of the World War II devastated countries. Truman worked closely with former President Herbert Hoover to build support at home and abroad. Dwight Eisenhower was also among those speaking out of the need for fighting hunger in order to win the peace. When Eisenhower later became president he started the Food for Peace program which today needs a funding boost to meet the growing humanitarian challenge. Food for Peace is the primary tool of the US when it comes to fighting global hunger. The program makes donations to countries suffering from hunger. For instance Food for Peace donations came to the aid of East Africa last year when a severe drought hit. The World Food Programme, Catholic Relief Services and other organizations distribute the food. The Food for Peace program though is only as strong as how much funding Congress allows when it makes the foreign policy budget. The funding range right now for Food for Peace is around $1.5 billion dollars a year, whereas the annual cost to the nuclear weapons program is at least $52 billion dollars a year. Today, there clearly is a need to boost the funding for Food for Peace and other aid programs given the size of the humanitarian disaster facing the globe. Increased emphasis to Food for Peace may be starting to take hold. So far this year U.S. Food for Peace donations to Yemen have increased over 2011. The most recent US Food for Peace donations totaling $47 million dollars will help feed Yemenis displaced by the ongoing conflict. President Obama’s focus needs to be on the ongoing humanitarian emergencies and also how to prevent them from recurring. This means peace efforts to end the conflicts causing so much hunger and displacement, and food aid to reinforce the peace. The key is to build up food production in impoverished countries. Increasing the resilience of the small farmer to drought, will be a key topic of discussion at the symposium along with how the governments and business leaders can work together to make this happen. Article first published as President Obama to Make Speech About Global Hunger Crisis on Blogcritics.